VajraPani, holder of the thunderbolt represents the energy of the enlightened mind and energy that breaks through illusion. VajraPani is a ferocious looking protector deity. He is said to devour ghosts. He holds a Vajra, diamond thunderbolt to cut through obscurations and he holds a hook to catch aspirants who loose their way or fall into darkness. VajraPani is shown dancing wildly within a halo of lfames, which represent transformation. He cuts through the darkness of delusion. 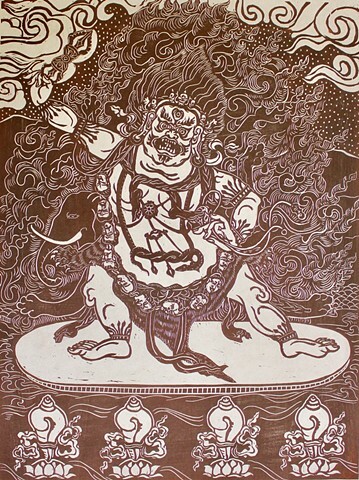 For VajraPani I painstakingly hand carved a mokuhanga woodblock. Mokuhanga is the traditional Japanese style of woodblock prints. The blocks are printed onto Japanese Kozo or mulberry paper by hand rubbing with a barren. The inks used are sumie and watercolor inks. Mokuhanga is a labor-intensive old school printmaking practice.